Before you call a repairman or an appliance company use the fault list below to find out what is causing your refrigerator problem. Review and test out some of the possible causes we have listed below. Then verify the cause and repair the fault yourself if possible. Common refrigerator parts online here. NOTE: This in-depth repair guide will AT LEAST give you an idea of the faulty appliance part that you may need to replace so that you may search online for the lowest price possible and REPAIR YOURSELF. Symptom Number 1 – Refrigerator light does not come on. Possible Causes For Malfunction (The below solutions are listed in order of MOST likely). Troubleshoot in the order as they appear…..
Possible Solution 1 – Replace the light bulb. Possible Solution 2 – Test the door switch mechanism. Symptom Number 2 – Refrigerator does not run and light doesn’t work. Possible Solution 1 – Make sure the refrigerator is plugged into the wall outlet. Possible Solution 2 – Check for a blown fuse or circuit breaker that is tripped. Possible Solution 3 – Test the power outlet for electrical current. Possible Solution 4 – Inspect the electrical cord for possible damage. Possible Solution 5 – Eliminate use of any extension cord. Possible Solution 6 – Check the outlet voltage with a meter. Symptom Number 3 – Refrigerator does not run but the light works. Possible Solution 1 – Check the current temperature setting knob. Possible Solution 2 – Make certain there is a 2 to 3 inch space between the walls and the back of the refrigerator. Possible Solution 3 – Clean the condenser coils. Possible Solution 4 – Unplug the refrigerator and wait one hour and plug it back in. Possible Solution 5 – Test the temperature control. Possible Solution 6 – Test the evaporator fan. Possible Solution 7 – Test the defrost timer. Possible Solution 8 – Test the compressor relay. Possible Solution 9 – Test the overload protector. Possible Solution 10 – Test the compressor motor. Symptom Number 4 – Refrigerator or freezer is extra cold. Possible Solution 2 – Test the temperature control system. Symptom Number 5 – Refrigerator makes strange sounds. Possible Solution 1 – Check that the refrigerator is on a flat level surface. Possible Solution 2 – Check the drain pan for water. Possible Solution 3 – Check the condenser fan. Possible Solution 4 – Check the evaporator fan. Possible Solution 5 – Inspect the compressor mount. Symptom Number 6 – Refrigerator runs continuously. Possible Solution 1 – Defrost the freezer. Possible Solution 2 – Clean the condenser coils. Possible Solution 3 – Check the refrigerator door seals. Possible Solution 4 – Test the door switch. Symptom Number 7 – Refrigerator starts and stops often. Possible Solution 1 – Clean the condenser coils. Possible Solution 2 – Check the outlet voltage. Possible Solution 3 – Test the condenser fan. Possible Solution 4 – Test the compressor relay. Possible Solution 5 – Test the overload protector. Possible Solution 6 – Test the compressor motor. Symptom Number 8 – Freezer does not defrost automatically. Possible Solution 1 – Test the defrost timer. Possible Solution 2 – Test the defrost heater. Possible Solution 3 – Test the defrost thermostat. Symptom Number 9 – Refrigerator has an bad odor. Possible Solution 1 – Remove spoiled food. Possible Solution 2 – Clean refrigerator interior. Possible Solution 3 – Clean the door seals. Possible Solution 4 – Remove breaker strips and check for wet insulation. Symptom Number 10 – Water on floor outside of the refrigerator. Possible Solution 1 – Check the drain pan. Possible Solution 2 – Check the ice maker water supply hose in and out from the water inlet valve. Symptom Number 11 – Water on the inside of the refrigerator. Possible Solution 1 – Clean the drain tube. Possible Solution 2 – If you have an ice-maker, check refrigerator and ice-maker for level. Symptom Number 12 – Refrigerator or freezer is not getting cold. Possible Solution 1 – Check the temperature setting. Possible Solution 2 – Make sure there is enough room for air flow in the refrigerator. Possible Solution 3 – Check for air flow restrictions in the vents. Possible Solution 4 – Test the temperature control. Possible Solution 5 – Clean the condenser coils. Possible Solution 6 – Check the door seals. Possible Solution 7 – Test the door switch. Possible Solution 8 – Test defrost heater. Possible Solution 9 – Test defrost timer. Possible Solution 10 – Test evaporator fan. Possible Solution 11 – Check for a clogged drain tube. Possible Solution 12 – Check for refrigerant leak. I have a maytag fridge Model PTB1953GE. During the last very hot summer it stopped cooling and freezing. My neighbor told me to turn it off and check for frozen coils. I did and found them frozen , I sit a bucket of hot water in the freezer and let them thaw out. It worked fine after that until a month ago. i did the same routine and it worked. This morning i noticed the same thing happening,but there was only a little ice buildup, I cleaned it out and it worked but only for a few minutes. I repeated the process and still the same results. The freezer fan just stops working. until I clean the ice. It’s only a very small amount of ice. I brush it off with a paint brush. l have LG fridge model no. GR-S362QC. The front panel went blank and all that is showing is a (H) L l pulled the power cord off and turned it back on and the screen was back to normal. All seemed to be good but after a few hours it went back to the (H) the lg service man in my country cannot find or solve the problem. I have a Samsung model RS2530BWP. The icemaker froze solid and froze everything in the freezer. It stopped dispensing ice because the entire mechanism was frozen solid. There was water leaking from somewhere that caused this to happen. Has anyone had this happen. What could the cause be? The fault on this Samsung is the evaporator is not getting cold and the evaporator fan not working, I have check to see if the 12v is coming form the reg but no voltage. I have a 1990 GE fridge. Never had any problems till now. Lately I smelled an electrical odor coming from fridge for a day or two now neither the freezer nor fridge work. At least it appears it only works 10% of capacity. I can hear motor running though. Lately it has slowly degenerated in cooling capacity such that freezer won’t freeze ice cream solid now this. It’s been such a good machine all these years. .
My GE Fridge from 1990 stopped blowing cold air in fridge & freezer … both the fan & lights work … I have checked front & back to make sure it is clean & free of dust built-up, but still the same … would freon air help this problem ? It has never been repaired before … Is it worth calling a repairman ? I have always kept the fridge / freezer on low to medium depending on the load inside ??? check for oil leak from compressor. May need new compressor if not repairable. We have a Kenmore Elite #71053 (I think) French door refrigerator. Our refrigerator and freezer went out at the same time. The repairman said there was a “constriction” in the line and it was making the pressure go up. It was 55# and was supposed to be 5#. He said there was nothing we could do for it that the blockage couldn’t be found. He said we would have to get another one. He said Kenmore was made by Samsung and it was nearly impossible to get parts for. This fridge is not that old (5-6 years) and still looks brand new. In the beginning of the year it stopped working. I called the repairman, replaced the motor (compressor) because it wasn’t working and he replaced the the pipes that transport the cold air to the fridge. It worked up until now. The fridge is working and running but it is not cold enough.. it doesn’t even freeze the ice cubes. I am not sure if it is those pipes that transports the cold air, maybe they are blocked? I have a Frigidaire freezerless refrigerator, approx. ten years old. It is blowing air, but the air is not cold. I had a repairman come by today, and he looked at it for 3 minutes and said that it is not holding freon and to get a new fridge. He did not try to put freon in, nor did he use any tools or meters on the unit. I asked if the drain plug could be clogged like an AC’s and he said no. Advice please. Can you supply us with the model number of your Frigidaire freezerless refrigerator? We can assist from there. Also, please let us know any other issues with the fridge in the past. Hi I have Samsung refrigerator model RS2530BWP and the refrigerator stopped cooling and freezing, but before that it was periodically making very loud noises. After further inspection I saw that there was a dark sticky oil (compressor oil?) that was leaking out of the back. There was no ice build up and I cleaned out the drainage pan. The fridge was already on the lowest cooling setting. Do you have any suggestions as to what I can do? The compressor may be leaking. Check the compressor for visible signs of a leak, if so, you will need to either replace the compressor, repair it, or get a new fridge if the repair or replacement is expensive. Where is the drain tube on a Kelvinator refrigerator – freezer on top. Water is filling up the bottom on the inside and is running out onto the floor. Please supply us with the model number of your Kelvinator Refrigerator and we can assist. I have a Whirlpool Refrigerator that will only work if I set the temperature to the coldest setting but if I set it to a warmer setting it just makes a clicking noise on the main board and won’t start or get cold what could be wrong with it??? Most likely the issue with your Whirlpool refrigerator is the temperature setting assembly itself. It may need to be replaced. Check it with a meter and visually to see if it is in working condition. I have a Maytag French door model and the freezer side works perfectly but the refrigerator side will not cool. Any suggestions? If the evaporator fan is not working the freezer or refrigerator will not cool properly. Turn the evaporator fan blade by hand. If the fan blade does not turn freely then replace the fan motor. If the defrost heater assembly is bad frost will build on the evaporator coils and will become covered with frost. When this happens the air flow through the coils will be less and cause the refrigerator to NOT cool. Check the evaporator coils to see if they are frosted over. If the evaporator coils are frosted over, test each component of the defrost system. Usually a part in the defrost system has gone bad and therefore making your freezer work properly, but not the fridge portion. Since you have replaced the parts you named and if the compressor will run, sounds to me as though the culprit may very well be the thermostat.You mentioned that there was ice build up on the coils when the cover was removed and that indicates that the defroster is not working. Having replaced the defrost timer, it seems to me that the problem must be the thermostat that is not working. Too late… I have already replaced it due to a constriction in the condenser coil. This issue was beyond my level of expertise, too costly & cheaper to replace it and be done. Thanks though. I have saved bookmarked your site for future issues. Happy New Year! My Frigidaire, refrigerator model # FFTR1814LWD and freezer are not cooling and not blowing air in the fridge at all, the light works, the compressor runs and evaporator fan inside the freezer is working. When I opened, the back panel ice was built up around where the thermostat and heater connect, of course that bit of ice is no longer the issue. I ordered a defrost timer and changed it. I am leaning toward a replacing the thermostat, the compressor relay and capacitor as, I really do not want to call a technician unless it’s absolutely necessary, meaning something I can’t figure out on my own. Please let me know if you think that will get my unit back up and running or if you think it I should replace something else? Want to order everything I need this time so as not to keep paying for shipping with multiple parts orders. Yes you can order those parts as they are the parts that may be bad and causing your issue. Have you checked the wiring harnesses as we have seen this issue happen from a simple loose wire harness… If the compressor comes on as it should, the start relay and cap are most likely okay. You may have a blockage in the fridge therefore causing your issue. Here is the CABINET Diagram and Parts List for your FRIGIDAIRE Refrigerator. 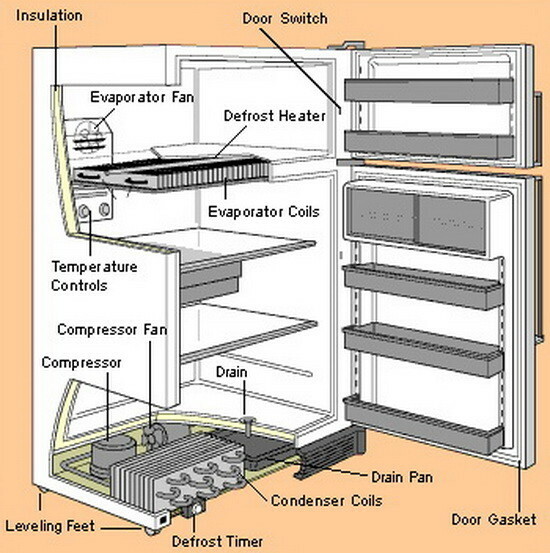 Here is the SYSTEM Diagram and Parts List for your FRIGIDAIRE Refrigerator. Let us know what you find. Freezer stopped working after an extension cord plug began to smoke. Extension cord was removed and refrigerator still works great but freezer stopped working. The refrigerator was tilted about 30 degrees to get it plugged in very tight quarters. It is fairly new as well but from Mexico. It is on a boat. It seems much quieter as well as if something is not turning on. What could it be? You may have tilted the refrigerator far enough to possibly get some of the compressor oil into the cooling lines. The key here is to NOT PLUG THE FRIDGE IN after it has been tipped or moved and there was or is a possibility of the oil from the compressor getting in the cooling lines. Since you already have it plugged in, give it about 24 to 48 hours to see if the freezer is going to work properly. The oil in the cooling lines need to flow back down into the compressor. If after the 48 hours is up and the freezer is not working, please get back to us with the make and model number of your refrigerator and we can assist further from there. Also… Never use an extension cord on any appliance. Kenmore refrigerator, model 106.7689313. The unit was working great until I discovered a massive cover of ice over the panel that covers the evaporator coil and water dripping from ceiling of the lower interior of the refrigerator cooling compartment. Removing the vertical panel in the back of the freezer section, I found the evaporator coil heavily frosted and a non-working fan which proved to be defective. The wiring feeding the evaporative fan motor is without current with AC plugged into the fridge. With everything turned “on” the compressor does not start on its own nor does its fan come on. Sometime back, the original compressor starter unit was replaced with a universal relay (3-n 1). By-passing the AC wiring to the compressor and feeding the starter kit with 110 voltage, the compressor runs. The fan motor underneath the unit also runs well if also directly fed AC. The defroster thermostat, defroster heat element, and temperature thermostat all check good. The fridge does not have a defroster timer per manufacturer. The interior lights work well. The wiring junction box is clean and connections are tight. Any suggestions as to what may be the cause of 110 AC not going through the unit nor getting to the compressor? This sounds like a wiring issue. If a universal relay was installed, that may be the issue. You may want to install the original OEM parts that was in place of the universal relay. Concerning the evap fan, have you tested the fan motor? If there is NO current going to the evap fan then trace the wiring to see if the wire harness is damaged or another component is causing the issue. Have you made sure all the wiring that connects to the compressor with the universal relay are secure and no damage is visible? Please let us know and we can hopefully help troubleshoot your issue. We have a 2006 Maytag three door refrigerator which has worked well until recently. Now the refrigerator does not cool, but the freezer works fine. The repairman has replaced the damper twice in the past 3 months. The last time he “lubricated” the gears in the damper and through up his hands, not able to give us an answer. It has now gone out for the fourth time in 3 months. Any ideas?